A bar trolley is different from other bulky home furnishing units. It is easily movable, easy to handle and can be taken anywhere around or outside the abode. It's a perfect party assistant to serve drinks and food together. BENGALURU, India - Feb. 17, 2018 - PRLog -- Bar trolleys are the staples in homes where a full-fledged bar space is present. These apparatuses for arranging the liquor bottles not only add glamour to the space but do act as perfect party assistants too. If you are a party person and host small congregations often, this generous piece of furniture will help you effortlessly. Just have everything on the platform, racks and hooks given in the bar trolley, and you won't miss a single gossip running at the conversation spot. Keeping other furniture units aside, a bar trolley is mobile, easy to carry and raises aesthetics. Given next are a few characteristics of bar trolleys you would like to know about. 1. Easy piling of things: A bar trolley can act as a still place to keep the kitchen and dining stuff altogether when you don't want to use it or migrate it from one place to another. One of the kitchen's corners is the best place to rest the piece of furniture, or you can also let it enhance the grace of the dining room against a blank wall. 2. Don't bother with the matching design: A bar trolley is not required to be harmonising the décor of the place and can be included in any shape, colour and size. No matter it is of a vintage design or has obtained the contemporary looks, the furniture unit will complement the interior nicely and merge very well around. However, for the classic ornamentation of your space, do select a wooden or glass bar trolley. 3. Sorts everything casually: In this hustle-bustle routine life, we need everything within our arm's reach. A bar trolley is exactly what you are looking for. The said furniture piece keeps everything casually sorted that you don't have to expand your search everywhere in the home. Place all the essential things over here, and you won't find any trouble in getting things. The bar furniture will be at your service all the time. 4. A glamorous party host: The usual scenario of a party in a home is people running in and out of the kitchen for getting the things. A bar trolley can be a glamorous party assistant to serve people and will make the crowd ask for it owing to the superb looks. Just organise everything clean and sorted on it and present the trolley in front of your guests. It will be fun hosting any party when every single commodity is within your easy reach. 5. It has uses outside the kitchen and dining: Unlike its name, a bar trolley can have several advantages in different areas of the home. It can be placed in the study and used to organise the literature or in the garden area to flaunt the plants. It can be a piece to decorate the knick-knacks in the living or it can be a part of the kitchen island for extending the storing surface. 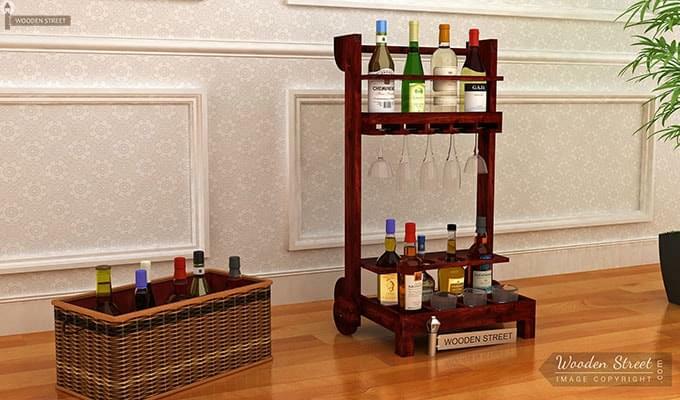 Conclusion: Pep up the untouched corners of your home with the versatile wooden bar trolley. Style them in any way you want and utilise them anywhere around the house. Apart from being the fun storage units and a luxurious sense of sophistication in the abode, bar trolleys can be used in various other creative ways. Wooden Street brings impressive designs of bar carts that are perfectly apt for every décor type. Get the desired one in a real buy at a pocket-friendly price tag and make a difference to the usual interior settings of your home.